Kaine Felix has arrived at Leamington from York City via Deeping Rangers. Leamington manager Paul Holleran has pulled off something of a coup by signing former York City attacker Kaine Felix. The 22-year-old, an unused substitute when the two sides met last month, was released by the Minstermen last week having made 24 appearances for the former Football League club, scoring once. Formerly at St Neots Town and Boston United where his form earned him a call-up to the England C squad, Felix ended last season on loan at Stockport County and Holleran believes the move to the Phillips 66 Community Stadium is just what the Huntingdon-born forward needs to kick-start his career. “He was on the radar when he was at St Neots,” said Holleran, who admitted he was surprised to beat off a number of higher-ranked clubs to land Felix. “York was a bit stop-start for him but there were a lot of clubs interested. “He’s still a young boy and feels Leamington is the right move for him. 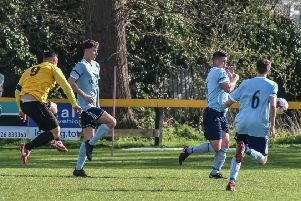 Felix scored twice on his debut for Deeping Rangers at the weekend, helping the United Counties League Premier Division side to a 6-0 win over Sileby Rangers as part of a short-term arrangement with the club. However, it was his form at Boston United, where eight goals in 76 games twice helped the York Street outfit reach the play-offs, which persuaded Holleran to make a move for the former Peterborough United Academy player. “He can play in any of the top three positions, right, left or down the middle,” said Holleran. “At Boston when they made the play-offs he was electric. “Balance-wise I felt that the right wide player would give us more depth and pace. “With Ahmed Obeng’s injuries and other things it has been difficult for him. “We have good cover in a lot of areas but out wide was a bit of a concern.